THE EQUALIZER - Maximum Recoil Reduction for Long Range Precision Rifles. Three large axisymmetric baffles, each featuring five helical ports, redirect a massive volume of gas away from the bore axis in a counter-clockwise radial direction. 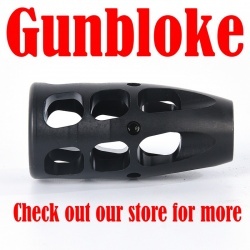 This not only provides maximum recoil reduction but also reduces the torsional recoil force associated with heavy bullets and fast twist rates. High tolerance class-3 threads machined in same operation as bore aperture ensures perfect concentricity; this combined with a progressively decreasing baffle thickness and maximized venting area significantly reduce bullet flight disturbance resulting in less yaw, higher BC, and improved accuracy. 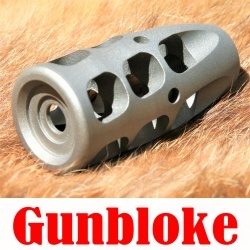 9/16x24 thread featuring High pitch diameter tolerance class 3B threads machined in the same operation as the bore ensures a perfect concentricity, this combined with a progressively decreasing baffle thickness and maximized venting area significantly reduce bullet flight disturbance resulting in less yaw, higher BC, and improved accuracy. 1/2"x28 TPI thread featuring High pitch diameter tolerance class 3B threads machined in the same operation as the bore ensures a perfect concentricity, this combined with a progressively decreasing baffle thickness and maximized venting area significantly reduce bullet flight disturbance resulting in less yaw, higher BC, and improved accuracy.